Objectives: To review the clinical signs, symptoms, diagnosis, treatment, bacteriology, and outcome of patients treated for lateral sinus thrombosis (LST). Materials and Methods: A retrospective review of nine patients treated with an intraoperatively confirmed diagnosis of LST. Nine patients presenting with LST of otogenic cause were included in this study. All charts related to clinical presentation, operation records, investigations, and other pertinent data were reviewed and analyzed. Results: All the patients were children aged 7-12 years. Computed tomography scan revealed the diagnosis of LST. None of the patients responded to initial conservative management. Patients underwent canal wall down mastoidectomy with evacuation of infected thrombus. Cholesteatoma was present in all the ears. Infected thrombi grew gram-negative organisms (Psuedomonas-6, Enterobacter-1, Klebsiella-1, and no growth in the other). Conclusion: In children with suppurative otitis media, clinical presentation of ear ache/headache, neck pain, or swelling with papilledema should warrant an evaluation to rule out LST and associated intracranial complications. Septic thrombosis of the lateral sinus is a well-recognized complication of suppurative otitis media with significant mortality. Modern antibiotic use has both decreased the incidence and altered the clinical presentation of suppurative intracranial complications of ear disease. Before the use of antibiotics, the commonest infective organisms were β-hemolytic streptococcus and staphylococcus. Classic symptoms of lateral sinus thrombosis (LST) include a ''picket fence'' fever, chills, progressive anemia (especially with β-hemolytic streptococci), symptoms of septic emboli, headache, and papilledema. Today, the introduction of antibiotics has greatly modified the clinical profile of LST. The purpose of this paper is to present varying trends in the presenting features of LST and to share our experience in treating this potentially lethal complication. Nine children suffering from atticoantral type of chronic suppurative otitis media and treated for LST were included in the study. Records of all these patients were reviewed regarding clinical features, diagnosis, treatment given, and outcome. Contrast enhanced computed tomography (CT)-scan was used to establish the diagnosis of LST. Ultrasonography of the neck was done before CT-scanning to assess the presence of associated neck abscess in the patients with torticollis. Patients were given initial course of intravenous broad-spectrum antibiotics, but surgical intervention was imminent as none of them responded to the initial intravenous antibiotic. Blood cultures of all the patients did not grow any organism. We were unable to perform audiometric tests for the children as they were not cooperative for the procedure. All the patients underwent canal wall down mastoidectomy with evacuation of septic thrombi from lateral sinus. Fresh bleeding after evacuation of thrombus was not noticed in any of the case. During surgery, the extent of the disease, condition of the sinus plate, dural plate, and upper neck were evaluated. Septic thrombi were sent for bacterial culture. Associated intracranial complications in the form of cerebellitis, hydrocephalus, and subtentorial abscess were noted in two cases. The internal jugular vein was not ligated in any of the cases. No systemic anticoagulants were given to any of the patients. Postoperative extended intravenous antibiotics were given with modifications as per the culture reports. The children were aged between 7 years and 12 years. Mean duration of present illness was 12 days. Fever, neck pain, ear ache, and ear discharge were the symptoms common to all. Apart from these, torticollis, tenderness along the course of Internal jugular vein and papilledema were found in a considerable number of patients [Table 1]. Ultrasonography was useful in identifying presence of neck abscess which was seen in eight out of nine cases. The neck abscesses were later found to be abscesses in and around the carotid sheath and upper IJV [Table 2]. All the patients underwent canal wall-down mastoidectomy under general anesthesia with evacuation of the septic thrombi from the lateral sinus. Extensive cholesteatoma with a large mastoid cavity and destruction of ossicular chain was a universal finding. Septic thrombi were evacuated as much as possible without waiting till fresh blood appears. Widespread destruction of sinus plate and dura due to enormous granulation tissue and cholesteatoma was encountered in one case. It is this case which later developed herniation of the temporal lobe [Figure 1]. No separate incision was made to drain the neck abscesses. Abscesses were decompressedby milking out the pus using gentle massage along the course of IJV. The subtentorial abscess seen in one case was drained through a posterior craniotomy. The cerebellitis seen in one case responded well to postoperative antibiotics. 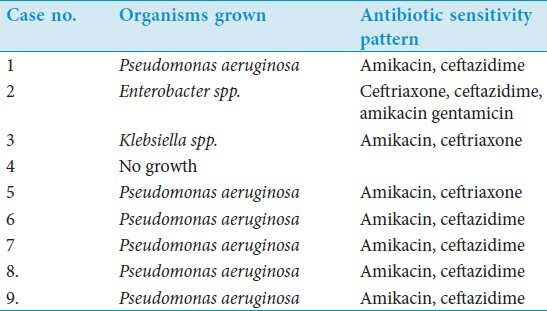 Bacteriology of the specimen from lateral sinus revealed pseudomonas as commonest infecting organism (six out of nine cases) [Table 3]. Other organisms grown were Enterobacter spp. and Klebsiella. One sample did not grow any organism. Blood cultures were negative. Cultured organisms were uniformly sensitive to amikacin. Sensitivity to ceftriaxone was seen in two cases and for ceftazidime in six cases. All patients recovered well except for one which developed herniation of temporal lobe. All the cases are under regular follow-up. LST is rare, often resulting in delayed recognition and treatment. Though the incidence has decreased worldwide, it still appears to persist in some developing countries. All the cases in our series were under the age of 12. Studies reported by Samuel and Fernandes  and Singh  points to the same tendency. There were predominantly male in the works published by Bento et al.,  Mathews,  and Singh. However, we came across a slight female preponderance (6:3). All the cases in our series displayed classic ''picket fence'' pattern of fever as described in the preantibiotic era. , This was observed even when the patients received antibiotics before they presented to our hospital. This presentation was different from previous published studies. ,, Earache is an important symptom as it suggests active ear infection and also may indicate intracranial infection. 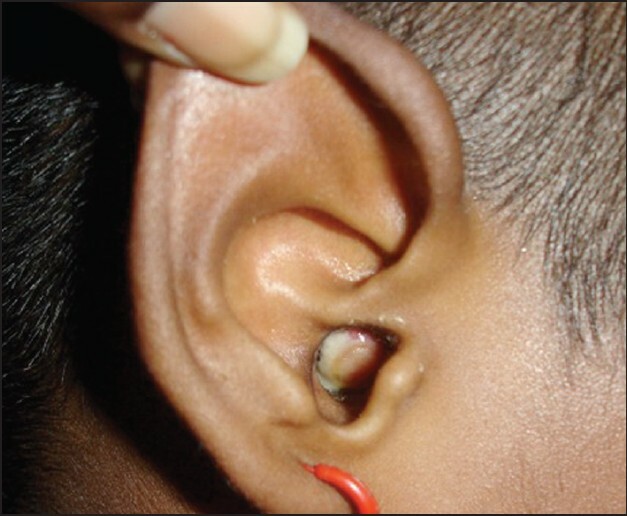 Earache was uniformly present in our series of cases. Neck pain with or without torticollis was noticed in all our cases. The neck pain of LST should not be confused with meningitis. It could be differentiated from meningitis by the fact that the neck stiffness is usually unilateral and other tests like Kernig's and Brudzinski's reflexes are absent. Literature review shows that the incidence of torticollis in LST is approximately 60%. ,, In a previous series, Wolfowitz identified neck pain and torticollis as the most consistent LST physical findings other than fever. The incidence of papilledema in LST was more than 50% in the series by Wolfowitz,  while Hubert  reported 34% incidence of papilledema. In our series, papilledema was diagnosed in seven out of the nine cases (77%). In our series contrast-enhanced CT-scan was sufficient enough to diagnose LST. One case required postoperative magnetic resonance imaging (MRI) to see for the resolution of the subtentorial abscess. However, Vowles  in his work regarding imaging modalities in LST states that radiological diagnosis of LST requires a combination of various techniques and high-quality MRI and magnetic resonance angiography are diagnostic modalities of choice. Ultrasonography was used in our series to detect IJV thrombosis. Furthermore, ultrasonography was helpful in identifying abscess in relation to IJV and carotid sheath. Koyuncu  was able to diagnose IJV thrombosis by ultrasonography in one of three cases in his series. All the cases in the present series were suffering from chronic suppurative otitis media of atticoantral type and extensive cholesteatoma was the feature in all the mastoids. Mathews  reported 25% incidence of cholesteatoma in his series of LST patients. Approximately, 50% cases had cholesteatoma in a series published by Bento et al. Previous studies by Samuel and Fernandes  state that infective granulation tissue (60%) was more common than cholesteatoma. The presence of the advanced atticoantral disease with extensive cholesteatoma in all cases prompted us to go ahead with canal wall down mastoidectomy. Perisinus abscess was encountered in all the nine cases. The reported incidence of perisinus abscess ranges from 10%  to 77%. We believe that formation of perisinus abscess should be the immediate preceding pathology before development of florid LST. The abscess which was present in and around the upper part of carotid sheath could be due to demineralization of the mastoid bone especially cribriform plate and mastoid tip which was universally noted in all cases with neck abscess. We believe that the neck abscesses noticed are secondary to an extension of a Bezold's abscess. There are only few reports of LST associated with neck abscess. Pearson et al.,  and Lubianca et al.,  each reported a case of LST associated with neck abscess. We were able to ''milk out'' the pus by massaging over the course of IJV which showed gushing of pus through the already destroyed mastoid tip. Similar technique was employed by Mathews. We feel that there is no need for a separate incision in the neck in cases where LST is associated with neck abscess. In none of the cases, fresh bleeding was established after thrombectomy. But since this did not affect the outcome, we believe that waiting for fresh bleeding from the sinus after thrombectomy is not necessary. Samuel and Fernandes  and Teichgraeber et al.,  also do not insist on fresh bleeding. Exploration of the sinus beyond the limits of the mastoid may not be necessary. As it is widely believed nowadays that ligation of IJV is not essential, none of the cases in our series underwent ligation of IJV. We encountered only two cases of LST associated with other intracranial complications. There was an associated cerebellitis and mild hydrocephalus in one case and a subtentorial abscess in another. The former resolved with conservative treatment, whereas the latter resolved only through surgical intervention via a posterior craniotomy. Review of literature shows high incidence of LST associated with other intracranial complications. Syms et al.,  in his retrospective review of his six patients found at least one additional intracranial complication in all the cases. Similar high incidence of additional intracranial complications can be found in the reports by Monalidis et al.,  Teichgraeber et al.,  and Samuel and Fernandes. None of the cases in the present series received anticoagulants. Blood cultures were negative in all the patients. However, ear swab cultures and cultures from septic thrombi from lateral sinus were positive in all but one case. It could be the first time in the literature that cultures were grown from septic thrombi in the lateral sinus. Cultures from the ear swab and septic thrombi had grown identical organisms. All the organisms were gram negative and were sensitive only to higher generation of antibiotics. Similar view is expressed by Seid and Sellars  and Teichgraeber et al. In our series Pseudomonas was the predominant organism occurring in six out of the eight positive cultures. Klebsiella and Enterobacter were grown in other two cultures. All the organisms were uniformly sensitive to amikacin. A similar finding is shared by Singh. Dramatic responses were obtained by adding amikacin to the antibiotic regimen. An overwhelming majority of authors carry out a mastoidectomy and evacuation of the thrombus after incising lateral sinus dura. However, some feel that conservative surgeries in the form of myringotomy (Bradley  and Bento et al.,  ) and needle aspiration of the pus (Bradley  ) or just unroofing of the lateral sinus without evacuation of the thrombus is sufficient (Singh;  Wong  ). However, due to extensive disease and cholesteatoma all the cases in the present series were subjected to modified radical mastoidectomy with evacuation of septic thrombi. The temporal lobe herniation which occurred in one case can be explained by the fact that there was widespread destruction of sinus plate and dura due to extensive cholesteatoma and granulation tissue. In children with chronic suppurative otitis media, features of active ear infection, fever, neck pain, and tenderness along IJV with papilledema should warrant aggressive diagnostic protocol to rule out LST. Children with the above features must undergo contrast-enhanced CT-scan to establish the diagnosis of LST. We advocate early and aggressive management in the form of modified radical mastoidectomy with evacuation of thrombi by incising the lateral sinus. There is no need for separate incision in the neck to drain out associated neck abscess if any. Ligation of the internal jugular vein and systemic anticoagulants has no role in the current management of LST. Gram-negative organisms sensitive to higher antibiotics are commonly encountered. Amikacin should be added to the antibiotic regimen for good results. 1. Samuel J, Fernandes CM. Lateral sinus thrombosis (A review of 45 cases). J Laryngol Otol 1987;101:1227-9. 2. Singh B. The management of lateral sinus thrombosis. J Laryngol Otol 1993;107:803-8. 3. Bento R, de Brito R, Ribas GC. Surgical management of intracranial complications ofotogenic infection. Ear Nose Throat J 2006;85:36-9. 4. Mathews TJ. Lateral sinus pathology (22 cases managed at Groote Schurr Hospital). J Laryngol Otol 1988;102:118-20. 5. Ludman H, Mawson S. Diseases of the ear. 5 th ed. London, 1988: Edward Arnold. p. 488-90. 6. Shambaugh GE. Surgery of the ear. 3 rd ed. Philadelphia: WB Saunders Company. 1980 p. 318-28. 7. Teichgraeber JF, Pee-Lee JH, Turner JS. Lateral sinus thrombosis: A modern perspective. Laryngoscope 1982;92:744-51. 8. Johrsdoerfer RA, Fitz-Hugh GS. Lateral sinus thrombosis. South Med J 1968;61:1271-5. 9. Wolfowitz BL. Otogenic intracranial complications. Arch Otolaryngol 1972;96:220-2. 10. Hubert L. Thrombosis of lateral sinus: Analysis of results obtained in one hundred and nineteen cases. JAMA 1941;117:1409-15. 11. Vowles RH. The imaging and management of lateral sinus thrombosis secondary to ear disease. CME Bull Otorhinolaryngol Head Neck Surg 2001;5:91-5. 12. Koyuncu M. Diagnosis of lateral sinus thrombosis with computed tomography, magnetic resonance imaging and M R Angiography. Turk Arch Otolaryngol 2000;38:51-5. 13. Bhatia S. Lateral sinus thrombosis as a complication of chronic suppurative otitis media. Indian J Otolaryngol Head Neck Surg 1996;48:110-3. 14. Pearson CR, Riden DK, Garth RJ, Thomas MR. Two cases of lateral sinus thrombosis presenting withextracranial head and neck abscesses. J Laryngol Otol 1994;108:779-82. 15. LubiancaNeto JF, Saffer M, Rotta FT, Arrarte JL, Brinckmann CA, Ferreira P. Lateral sinus thrombosis and cervical abscess complicatingcholesteatoma in children: a case report and review. Int J Paediatr Otorhinolaryngol 1998;42:263-9. 16. Syms MJ, Tsai PD, Holtel MR. Management of lateral sinus thrombosis. Laryngoscope 1999;109:1616-20. 17. Monalidis S, Kutz JW Jr. Diagnosis and management of lateral sinusthrombosis. Otol Neurotol 2005;26:1045-51. 18. Seid AB, Sellars SL. The management of otogenic lateral sinus disease at Groote Schuur hospital. Laryngoscope 1973;83:397-403. 19. Bradley DT, Hashisaki DT, Mason JC. Otogenic sigmoid sinus thrombosis: What is the role ofanticoagulation? Laryngoscope 2002;112:1726-9. 20. Wong I, Kozak FK, Poskitt K, Ludemann JP, Harriman M. Pediatric lateral sinus thrombosis: Retrospective case series and literature review. J Otolaryngol 2005;34:79-85.